Recruitment offers are before you from the Higher Education Department KPK Jobs 2019 ETEA Online Apply Last Date. Applications are being offered from the KPK’s Higher Education Department, Management Sciences College the services of well disciplined, caliber and adroit applicants are required to apply for the posts given below. 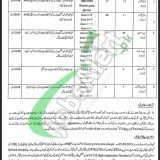 Jobs in Directorate of Higher Education KPK are (Junior Clerk (Female) (17 Posts), Junior Clerk (Male) 30 Posts), Lab Assistant (Female) (57 Posts), Lab Assistant (Male) (19 Posts), Hostel Warden (Female) (09 Posts), Library Clerk (Male) (03 Posts)) these posts are announced on Open Merit, Female Quota, Zone Quota. The appointment will be made on contract basis for the period of one year which is further extendable on satisfactory performance of an individual. For these posts, the applicants should possess BA / BSc / Matric (Science) and relevant skills and experience is required to apply. Male and females both applicants are welcome to apply. Attractive salary package will be given to the applicants with growth offers and congenial environment. Now, let’s tap to have its further details below. Applicants are required to apply online from ETEA’s website as www.etea.edu.pk. A printed copy of application form with a token number and deposit slip of Rs. 500/ should be paid on HBL Bank with copies of all documents, CNIC, Domicile and recent passport size photograph should reach at the said address. The last date for applying is March 19, 2019. Address: ETEA Office, Plot No, 22, Street No, 13, Sector E-08, Phase-07, Hayatabad, Peshawar.